New York to London to Milan to Paris. With only a few designers left to debut their fall 2015 collections, fashion week is nearing an end. Some have pulled their inspiration from the 70s, while others were stirred by the Deco skyscrapers of Bryant Park. Known for their extraordinary dresses and precise attention to detail, Marchesa's Georgina Chapman and Keren Craig looked to F. Scott Fitzgerald for inspiration. Models wore dresses with dropped waists and were draped in beads, feathers, and tiers of fringe that wouldn't be out of place at a 1920s Gatsby party. Marchesa gowns are a staple on the red carpet, but Chapman insists that the "runway and red carpet are completely different things" to them. She said, "If someone contacts us and wants to wear one of these dresses on the red carpet, that’s wonderful, but the clothes today are really as ready to go to the Academy Awards this weekend as they are some party in New York." Either way, their dresses next fall will unleash every girl's inner Zelda. The Saint Laurent show took place yesterday in Paris. Although tulle was present on both Marchesa and Saint Laurent's catwalks, the two collections couldn't have been more different. As a song by The Felines, a girl punk garage band out of Copenhagen, blasted from the speakers, models walked the runway. 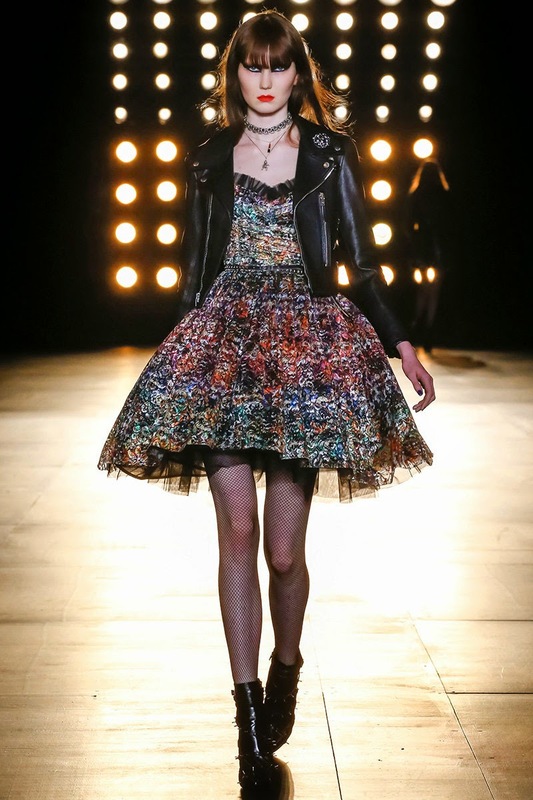 All of the looks were very rocker chic with ripped tights, biker jackets, and short skirts lined with tulle. Creative Director Hedi Slimane created something special that would make Debbie Harry swoon. Last week I visited Colorado Fabrics and purchased a faux leather designer textile that came straight from New York. Using my dress form, I draped and cut a new pattern out of muslin. The fabric was a cinch to work with and already had a great backing to it. I added the white waistline with belt loops to break up the blue. It turned out to be a fun dress that can be worn in the spring or fall.